According to newspaper and Spiritualist accounts of 1874, some very strange things were happening on a small Vermont farm near the town of Chittenden. Allegedly, all manner of bizarre phenomena was said to be taking place in the home of William and Horatio Eddy, two middle-aged, illiterate brothers, and their sister, Mary. The Eddy’s lived in a unkempt, two-story building that was reported to be infested with supernatural beings of such numbers that had never been reported before, or since. The events at the farm were said to be so powerful and so strange that people came from all over the world to witness them. Spiritualists began calling Chittenden the "Spirit Capital of the Universe". Needless to say, not everyone was convinced of the legitimacy of the reported events on the Eddy farm. Once such man was a successful attorney named Henry Steel Olcott. Prior to hearing of the Eddy brothers, Olcott had no interest whatever in the burgeoning Spiritualist movement. However, one day as he returned to his office from lunch, he picked up a copy of the Spiritualist newspaper, the Banner of Light. In the paper, he read a graphic account of the strange happenings that were being reported in Chittenden, Vermont. It’s unlikely at that time that Olcott had any idea how a simple newspaper article was going to change his life. It is important that we establish the fact that Henry Olcott was not connected in any way to the Spiritualist movement, nor was he a proponent of the paranormal. What might have prompted him to pick up a copy of the Banner of Light that day is unknown. Olcott was born in New Jersey in 1832 and attended college in New York City, studying agricultural science. While still in his early ’20’s, he received international recognition for his work on a model farm and for founding a school for agriculture students. During this same time, he published three scientific works. He went on to become the farm editor for Horace Greeley’s newspaper, the New York Tribune. When the Civil War broke out, Olcott enlisted in the Union Army. He was appointed as a special investigator to root out corruption and fraud in military arsenals and shipyards. He was soon promoted to the rank of Colonel and after the war, was part of a three-person panel that investigated the assassination of President Lincoln. After the war, Olcott studied law and became a wealthy and successful attorney. So how would an agriculturist and military investigator go on to become one of the first American psychic researchers? After buying a copy of the Spiritualist newspaper, Olcott read with interest the reports from the Eddy farm. Although skeptical, he knew that if the stories were true, "this was the most important fact in modern physical science," he later wrote. A short time after first reading the story, Colonel Olcott traveled to Vermont, accompanied by a newspaper artist named Alfred Kappes. Together, they planned to investigate the strange events at the Eddy farm and if the stories were a hoax, they would expose the Eddy brothers in the Daily Graphic newspaper as nothing but charlatans. If the Eddy’s were true mediums, Olcott would announce the validity of Spiritualism to the world. In either event, Olcott was determined to be fair and open-minded in his judgments. Olcott and Kappes traveled to the secluded town of Chittenden, located within the Green Mountains. The trip out to the farm was uneventful, but the first meeting with the Eddy brothers was anything but ordinary. The two distant and unfriendly farmers were rough-hewn characters with dark hair and eyes, and New England accents so thick the New York attorney and writer could scarcely understand them. Olcott would later learn that the brothers were descended from a long line of psychics. Mary Bradbury, a distant relative, had been convicted of witchcraft at Salem in 1692. She had escaped the village with the help of friends. Their own grandmother had been blessed with the gift of "second sight" and often went into trances, speaking to entities that no one else could see. Their mother, Julia, had been known for frightening her neighbors with predictions and visions although her husband, Zepaniah, condemned her powers as the work of the Devil. Julia quickly learned to hide her gifts from the cruel and abusive man. However, the supernatural could not be hidden once the couple began having children. Strange poundings began shaking the house, disembodied voices were heard in empty rooms, and occasionally, the children even vanished from their cribs. They were likely to be discovered anywhere in the house and even outside. As William and Horatio got older, their strange powers strengthened. On many occasions, Zepaniah would see the boys playing with unfamiliar children - who would vanish whenever he approached! When these “visitors” vanished, he would take his boys to the barn and beat them with a rawhide whip as punishment. The strange children returned again and again though, earning the young Eddy boys countless beatings. Eventually, they would grow to both fear and hate their father. The boys soon learned they were unable to attend school. The initial attempts were marked by inexplicable happenings and disturbances as invisible hands threw books, levitated desks and caused objects like rulers, inkwells and slates to fly about the room. Zepaniah tried everything he could to stop the disturbances, although this mostly consisted of him beating and abusing the youngsters. The strange events continued though. When he realized that he couldn’t stop the weird antics, he grew furious. Each time the boys fell into a trance, he would berate and verbally abuse them. He would try to rouse them by pinching and slapping them until they were black and blue. Once, on the advice of a sympathetic Christian friend, he doused the boys with boiling water. When this didn’t work, he also allowed this friend to drop a red-hot coal into William’s hand. He had hoped to "exorcize his devils". The boy never awakened from his trance, but he bore a scar on his palm for the rest of his life. Only after their father died were the boys able to return home. They moved onto the family farm with their sister, Mary, and opened the house as a modest inn called the Green Tavern. These things were all learned later. On his arrival, Olcott was only able to gain a first impression of the belligerent and unfriendly men. They were certainly not the deceitful con men he had expected. So, what were they? On Olcott’s first day at the farm, he was witness to an outdoor séance. In the bright moonlight of a warm summer evening, a group of ten participants traveled down a path and into a deep ravine. They assembled in front of a natural cave, formed by two large stones that had collapsed atop one another, forming a large arch. Olcott later learned that it was called "Honto’s Cave", in honor of the Native American spirit who often appeared there. Olcott suspiciously investigated the cave and but that no exit could be found at the back of the rocks. He determined there was no way that anyone could slip in or out of the cave without being seen. Horatio Eddy acted as the medium for the séance. He sat on a camp stool under the arch and then was draped in a makeshift "spirit cabinet" formed by shawls and branches that had been cut from small saplings. As Horatio rested there, a gigantic man, dressed as a Native American, emerged from the darkness of the cave. While the medium addressed this spirit, someone cried out and pointed up toward the top of the cave. Standing there, silhouetted against the moon, was another gigantic Indian. To the right, another spectral female had materialized on a ledge. In all, 10 such figures appeared during the séance. The last, the spirit of William White, the late editor of a Spiritualist newspaper, emerged from within Horatio’s cabinet. He was dressed in a black suit and white shirt was supposedly recognizable to some who had read the newspaper and recognized his picture from it. He vanished at the same time the others did. Moments later, Horatio appeared from the cabinet and signaled that the séance was at an end. After the bizarre display was over, Olcott and Kappes carefully searched the cave and the surrounding area for footprints in the soft earth. They found no trace that anyone had been there. Olcott found the séance to be convincing but was sure that he would be able to more easily detect fraud within the controlled setting of the Eddy house. He and Kappes thoroughly examined the large "circle" room, which was located on the second floor of the farmhouse. He drew maps, charts and diagrams and took numerous measurements, sure that he would find false panels, secret doors or hidden passages. However, he found nothing out of the ordinary. He was determined not to give up though and he convinced the newspaper to hire men to come to Chittenden and examine the place. Using carpenters and engineers as consultants, another thorough search was conducted. The experts also found nothing strange. After this, Olcott and Kappes were finally convinced that the walls and floors were as solid as they seemed. Because of this, what Olcott witnessed during the nights that followed became even stranger. Each séance was basically the same. On every night of the week, except for Sunday, guests and visitors would assemble on wooden benches in the séance room. A platform, which had been assembled there, was lit only by a kerosene lamp, recessed in a barrel. William Eddy, who acted as the primary medium, mounted the platform and entered a small cabinet. A few moments later, soft voices began to whisper in the distance. Often, it would be singing, accompanied by spectral music. Musical instruments came to life and soared above the heads of the audience members, disembodied hands appeared, waving and touching the spectators and odd lights and unexplained noises appeared and filled the air. Then, the first spirit form emerged from the cabinet. They came one at a time, or in groups, numbering as many as 20 or 30 in an evening. Some were completely visible and seemed solid. Others were transparent and ethereal. Regardless, they awed the frightened spectators. The spirits ranged in size from over six feet to very small (it’s worth noting here that William Eddy was only five feet, nine inches tall). Most of the ghostly apparitions were elderly Yankees or Native Americans but many other races and nationalities also appeared in costume like Africans, Russians, Orientals and more. Where had they come from? Olcott pondered. He had examined the spirit cabinet and platform and had found no trap doors, nor hidden passages. In fact, there was no room in the cabinet for anyone other than the medium himself. 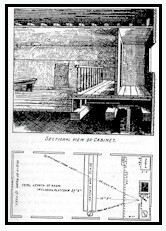 Olcott was familiar with the workings of stage magicians and fraudulent mediums, but could find none of their tricks present at the Eddy house. The apparitions not only appeared but they also performed, sang and chatted with the sitters. They also produced spirit articles like musical instruments, clothing and scarves. In all, nearly every type of supernatural phenomena was reported at the Eddy farmhouse. These included rappings, moving physical objects, spirit paintings, automatic writing, prophecy, speaking in tongues, healings, unseen voices, levitation, remote visions, teleportation and more. And of course, the full-bodied manifestations of which Olcott observed more than 400 during the weeks he visited the house. He concluded that a show like that which he had seen would have required an entire company of actors and several trunks of costumes here. In addition, such an elaborate show would have cost a fortune to produce each night. They would have had to pay actors, invest in costumes and hire someone to create the "marvels" of the spirits. This would have been impossible given that the brothers were almost penniless. Most of the visitors who came to the farm did not pay and the rest only gave $8 per week for room and board at the inn. No admission was ever charged for the séances. In Olcott’s mind, fraud would have been physically and financially impossible! The investigator’s ten-week stay on the Eddy farm was surely a test of endurance. He left disliking the house, the food, the weather and the Eddy brothers. However, he was also convinced of the fact that the two men could make contact with the dead. Not only did Colonel Olcott chronicle his visit in the newspaper, but he also wrote a massive book called People from Other Worlds. The book, over 500 pages long, is full of precise drawings of the apparitions, the grounds, the house and even detailed plans of its construction, proving that no hidden passages existed. He also recorded over 400 different supernatural beings and collected hundreds of affidavits and scores of eyewitness testimony to the amazing events. He also reproduced dozens of statements from respected tradesmen and carpenters who had examined the house for trickery. A modern reader would have to look very hard to discover anything that Olcott did not investigate. Eventually, the Eddy brothers and sister Mary, went their separate ways. Their bickering and feuding had driven them apart. Horatio moved out and took a house across the road, where he took up light gardening, occasional séances and doing magic tricks for local children. Mary moved to the nearby village of East Pittsford, where she became a full-time professional medium. William dropped out of public life altogether and became a bitter recluse on the family farm. The first of the Eddy’s to die was Horatio on September 8, 1922. William lived for another 10 years. He never married and refused to ever participate in Spiritualism again. He died on October 25, 1932 at the age of 99. If either of the men had any secrets about the weird events at their home... they took the secrets with them to the grave. So, what really happened on the Eddy farm in Chittenden, Vermont? To read this story today, we are first inclined to dismiss the events as fanciful tales from another time, but can we really do that? The credentials of Colonel Olcott prohibit us from dismissing the story out of hand. His extensive documentation, along with his investigative skills, suggests that the events were not part of a hoax. Olcott remained skeptical and analytical throughout his ten-week stay at the farm, and yet he came away convinced that the Eddy’s had the power to contact, and communicate with, the dead. Colonel Olcott came away from Chittenden a believer. So whatever you choose to believe, it cannot be denied that something amazing and mysterious occurred in Chittenden in 1874 although what this may have been, we may never know for sure.